Review: Hell, No To The Chaotic, Repetitive, Hard-R Hellboy Comics creator Mike Mignola's gruff demon-hero gets a hard-R reboot that swaps out the charm of director Guillermo del Toro's previous iterations and replaces it with "chaotic, repetitive" gore. Aw, crap: David Harbour stars in the 2019 reboot of Hellboy. 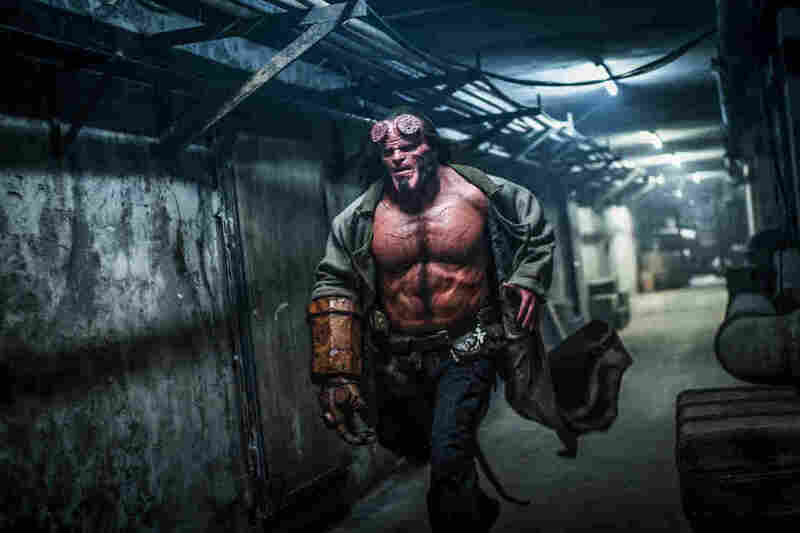 Hellboy, despite its colon-free title, is actually the fifth movie starring the good-guy demon hero (if you count the two animated films that featured the same cast as the live-action films made by monsteur auteur Guillermo del Toro in 2004 and 2008) and it's even more exhausting than this sentence. Pity. The blue-collar, crimson-skinned agent of the Bureau for Paranormal Research and Defense — basically a more inclusive version of the Men in Black, with a more casual dress code — is a marvelous character on the page. And because filmmaker del Toro has at least as much affection for 1930s serials and monster movies and European folklore as cartoonist Mike Mignola (Hellboy's creator) does, his two adaptations of Mignola's comics were revered. But like most del Toro films they were only moderate box office successes, and the profligate profitability of Marvel movies in the subsequent decade (Hellboy is a creator-owned specimen of IP, outside the Disney megalith) demanded that someone try to tap that rich vein again. Englishman Neil Marshall would appear to be a sterling candidate: He made a trio of well-regarded low-budget genre flicks and directed two episodes of Game of Thrones, including "Blackwater," which featured the climactic battle of the series' second season. The chaotic, repetitive movie he's given us here calls into question not just his competence but his taste. He's de-emphasized the warmth del Toro brought to the material and amped up the limb-rending and especially the eye-piercing a hundredfold. This is clearly a calculated decision; with the majority of comic book films sticking to PG-13 levels of genocide, all this gristle and viscera has at least a chance of making Hellboy '19 feel distinct. But the gore is deployed too indiscriminately to provoke anything other than bored revulsion, offering neither a sense of threat nor comic punctuation, the way it does in, say, the Evil Dead movies. The flying entrails aren't the only element that feels hacky. Marshall scores most of his big set pieces with soundalike selections of ersatz blooze-rock. (The last one uses Mötley Crüe's 1989 jock jam "Kickstart My Heart," saving the best for last, I guess.) He has apparently directed star David Harbour — replacing Ron Perlman as the demon with the red and extremely rocky right hand — to elongate his line readings like Point Break-era Keanu Reeves whenever he wishes to convey irritation, which is most of the time. Maybe the actor is just trying to be heard under all that monster makeup. Harbour, a pleasingly idiosyncratic performer on Stranger Things and in the Bond flick Quantum of Solace, does not possess Perlman's long-honed talent for conveying complex emotion through latex. The rest of the cast is fine. Its biggest get is Ian McShane, doomed for all eternity to lend his profane tenor to stuff that is not as good as Deadwood, who plays Trevor Bruttenholm, the cranky paranormal scholar who found baby demon Hellboy in 1944 and raised him as his own son. (There's a line of dialogue about some kind of spell that makes both characters age slowly.) Milla Jovovich plays a witch who was dismembered and buried in several different coffins by King Arthur, only to rise again in the 21st century to bring about Armageddon by... copulating with Hellboy, I think. If Jovovich was ever on set as the same time as the other actors, it doesn't feel that way. Daniel Dae Kim replaced Ed Skrein as special forces soldier and undead were-jaguar Ben Daimo— a character of Japanese-American extraction — during pre-production, after complaints of whitewashing. Texan Sasha Lane plays BPRD agent Alice Monaghan, whom Hellboy rescued from abduction by malevolent fairies when she was just a baby. There's an attempt to give the later two an esprit de corps with Hellboy, but the movie never pauses long enough between monster battles for any of its character work to stick. We have to hurry up and get to the destruction of London, and then the undestruction of London. It all feels weightless and reversible, which makes it feel endless. Some of Mignola's most memorable Hellboy stories have been short ones — like "The Corpse," which presented the rescue of little Alice depicted in flashback in the new movie — so it's fitting, I guess, that this movie features exactly two terrific sequences that could be carved out and presented as shorts. In one of them, Hellboy consults Baba Yaga, a rotting, crab-like witch who lives in a house mounted on giant Ostrich legs. Her domicile is the most arresting image in the movie, but Baba Yaga's tactile appearance and otherworldly way of scurrying about the frame lingered with me, too. And Hellboy's re-introduction, wherein he must recover a fugitive BPRD agent from a Tijuana sports venue where his target is participating in a lucha libre match, plays like a cold open from a Bond flick — a witty, self-aware sequence that sets a tempo the film's remaining 105 minutes can't meet. Much of the appeal of Mignola's comics lies is in his angular, heavy-ink style, which in addition to conjuring mood and atmosphere, makes the gnarly stuff less gross to look at. (Other artists who've drawn the character, like Duncan Fegredo, have followed Mignola's example.) Rendering all this stuff in photorealistic CGI does not necessarily add value. If we have to have more Hellboy movies and del Toro isn't going to make them, maybe they should be shot in black and white.